Daily from April 1st to October 10th. 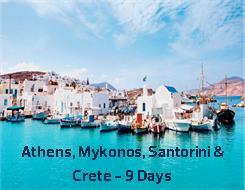 Accommodation on BB, 2 nights in Athens, 2 nights in Mykonos, 2 nights in Santorini and 2 nights in Crete. Ferry tickets Piraeus - Mykonos regular ferry and Mykonos - Santorini // Santorini - Heraklion with high-speed ferry, economy class.